White House Visit | NOVA Cool Cats Special Hockey, Inc.
Five players from the American Special Hockey Association (ASHA) were among a group of 70 children who joined President Barack Obama and First Lady Michelle Obama along with members of the Chicago Blackhawks and Washington Capitals as part of the Let’s Move initiative. 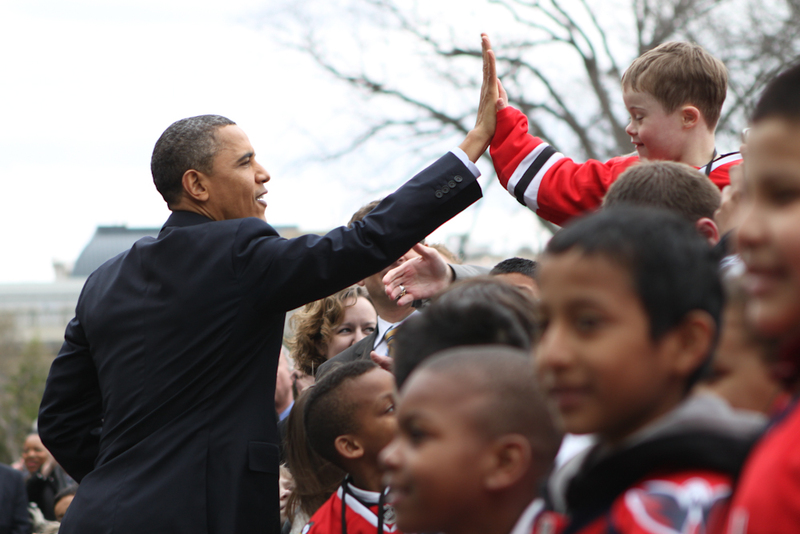 The day started off with a ceremony with President Obama honoring the 2009-2010 Stanley Cup Champion CHICAGO BLACKHAWKS. Following the ceremony, First Lady Michelle Obama, NHL Commissioner Gary Bettman and USA Hockey Executive Director Dave Ogrean presided over a street hockey workout and clinic on a rink set up on the South Lawn of the White House. The clinic for local youngsters, which was conducted by members of the Blackhawks and Washington Capitals, is part of a new collaboration between Mrs. Obama’s Let’s Move! initiative, the NHL and USA Hockey to encourage American children to lead active and healthy lives. "It was an incredible day for our Special athletes as they were able to experience a day at the White House and participate in a fun and healthy street hockey clinic", said Mike Hickey, President of the American Special Hockey Association. Dave Lucia, Legislative Director of ASHA programs and Head Coach of the Montgomery Cheetahs also accompanied the five players. The players were invited to represent ASHA as part of the NHL “Hockey is for Everyone” initiative as well as being part of USA Hockey Disabled Section. "Our players love the game of Hockey so much and for them to be able to be showcased at such an event is even more special", continued Hickey. ASHA would like to thank the NHL, USA Hockey and the White House for allowing us to be part of such a great event.